Preparing your eyelash extension kit is a huge part of eyelash extension classes. By learning the basics at Florida Academy of Medical Aesthetics in Pembroke Pines, you can give your clients the best eyelash extensions possible. As an aesthetician school, we have all the resources to give our students so that they can be prepared to do the best they can for their clients. Contact us to learn more about our eyelash extension workshop. Tweezers are critical for the safe and effective application of lashes. With tweezers, you avoid putting your hands directly on the lashes or on the client’s eyelid and keep the process as hygienic as possible. The best kind of tweezers for your purposes are going to be L-shaped tweezers that taper at the tip. This allows for delicate application and makes it easy to adjust the extension if necessary. It is also good to have a pair of straight tweezers to separate lashes in the event that they clump before or after applying them to the eyelid. The quality of your glue is ultimately going to reflect the quality of your extension. If the client has to return because the eyelash extension shifted or fell off, it will reflect poorly back on you. That is why it is important to use an eyelash glue that has a fast bonding time—so the process is not timely—and a significant amount of hold time so clients can wait four to six weeks before their next application. You also want to make sure that the ingredients in your glue are organically based and won’t emit strong fumes that could harm both you and your client. An eyelash brush can be a versatile tool in your kit. It can be used to straighten the lashes before and after application as well as to clean the lashes with the help of warm water and makeup remover. It can even be used to remove an eyelash extension with adhesive remover. It is crucial to keep eyelash extensions clean, as germ and debris buildup can not only harm the integrity of the extension, but also cause negative health effects on the client. Because eyelash extensions are sensitive and subject to damage when exposed to harsh chemicals, it is imperative that you select a shampoo that is not oil-based and that it is free of irritants and made with natural ingredients. When you apply eyelash extensions, you want to ensure that the bottom and top lashes do not stick together. With eye pads, you can cover the bottom lashes as you are applying the top lashes. Make sure that they have a light layer of adhesive to hold them to the skin or keep them in place with medical tape. At an aesthetician school, you can learn more about the necessities for your extension kit and what can help you do better for your clients. 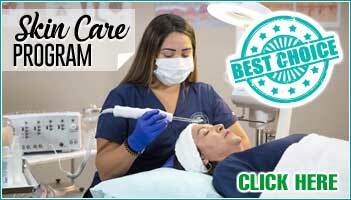 Florida Academy of Medical Aesthetics in Pembroke Pines is the school that can be that resource for you. Visit our website or contact us to learn more about our courses in eyelash extension application and other aesthetic practices. If you have questions about Florida Academy of Medical Aesthetics in Pembroke Pines or you would like more information about our aesthetician school and eyelash extension classes, contact us today.